Battle Isle II follows upon the formula Blue Byte previously used in Battle Isle and History Line, but with some heavy changes. The result is a game that LOOKS familiar to Battle Isle veterans, but furnishes a much more enjoyable and enticing experience. There's actually a plot behind this one -- and a good one at that. You are 'kidnapped' from your home world and brought to another world to help them defend themselves. It seems their planet is being attacked by aliens, and they want you to command their battle forces. Do so, and you can return to your home world if you wish with many riches and rewards lavished upon you. This is all explained in a crisp looking (for its day) intro with text and nice graphics. While the story may seem far-fetched to some people ("what, me worry? 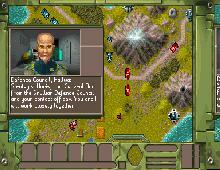 "), during the game you get information and advice from many other people in pop-up text buttons with graphics. You only have one campaign to finish, although you can jump ahead with passwords and play another human, but the computer AI is quite good and will probably pound you until you get used to the game. The screen is "whole" this time -- no split screen! -- and has nice looking VGA graphics. Controls are also pretty easy -- using the mouse or keyboard, you still move an icon around, but clicking on a unit in an icon brings up a number of options on the bottom bar. Select what you want by moving the mouse over it and click, and cancel by a right-click. To make life even easier, the mouse cursor is "pre-selected" to be over the most common commands when you select a unit -- either Move or Attack. In that case, a quick double-click will instantly allow you to move or attack instantly. There is not a lot of music or sounds in the game but what there is is good, and despite the difficulty of the AI at first, you can easily get into it. The most serious knock against Battle Isle II is how some information is conveyed. When you look at a unit, for example, it's not clear how much damage it has taken. There are two numbers way over on the right side of the information bar at the bottom of the screen -- the top one is the combat strength of the unit. You'll have to look at this before you enter combat to know what the 'normal' health of your unit is. Also, the battle screen -- when it shows both units shooting at the same time at each other -- is good looking, with its 3D presentation of the battle units, but you may not be able to see how much damage was actually done on the other unit because their units are on the OTHER SIDE of the battlefield. Annoying, to say the least. These downsides, though, do not overshadow what works in this game. Blue Byte kept the basic formula from Battle Isle and History Line in Battle Isle II -- a tactical, "light" war game, broken into battlefields and with many different units and factories to build new ones -- and added in new stuff such as easier and more streamlined controls, a good story, better graphics, music and sound effects, and a good AI. If you've liked other Blue Byte games, you'll love this one. For a player new to tactical wargames, it's also one of the most easy to control and challenging games you can get started with. It may look simple compared to modern war games, but it's still a blast to play!